PLEASE read this article before printing the application. After reading the article (above) you may print the application and fill it out by hand or fill it out online and then print it. Please send it in US Mail once it is completed and signed. Remember that the potential adopter must be the person who signs the application unless the signer has Power of Attorney. GEOGRAPHICAL LIMITATIONS: We seldom place outside of the state. Occasionally a harder to place dog may find a home in a neighboring state but due to the difficulties in enforcing contracts, doing home visits, getting the dog transported back to us if the adoption doesn’t work out, etc., it is rare that a dog would go to a distant state. AGE LIMITATIONS: We NEVER place a rescued westie with children under the age of ten. This doesn’t mean your child won’t be good with Westies. But frequently rescued Westies are not good with children. Many of the rescues come to us due to issues with children. And some may be great with the family children but overly protective about them around their friends. We cannot make exceptions no matter how wonderful and well-mannered and mature your children are. 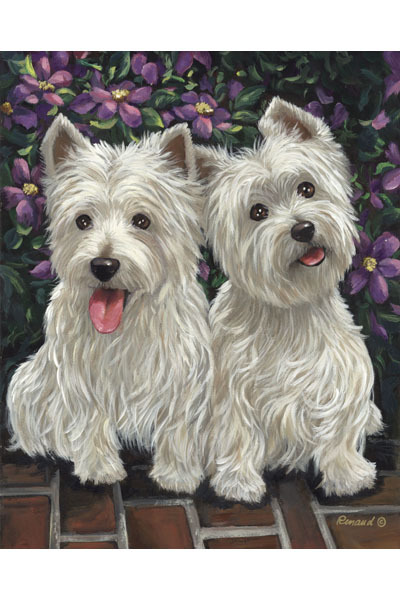 If you must put a westie with your young children, please consider buying a puppy from a responsible breeder who is breeding for good temperament; then plan on spending as much time raising your puppy as you do your children.